I hope everyone has a great break and happy holidays! This entry was posted in Uncategorized on December 18, 2014 by sydnee wagner. So this is the first part of my dataset project. During Halloween, after a couple hours of binge eating fun-sized candy bars and marathoning various scary movies, I got the idea to use horror films as a dataset for this class, given my personal and semi-scholarly interests in the genre. Obviously, this deviates from my research on early modern literature, but I am not new to using horror films as the focus of other academic research. 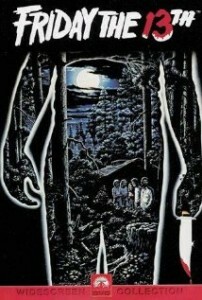 Movie poster of Friday the 13th (1980), courtesy of IMBD. With that half-baked idea in mind, I set out to narrow my focus a little to get a central theme for the data that wasn’t just the genre itself. I decided to exclusively use films made in the 1980s, a decade for horror films that was especially prolific. Many of these horror films, such as They Live and The Stuff, served as thinly veiled political commentary against an increase in enthusiastic republican politics and capitalism. Wes Craven, popular horror director, explained in the horror movie documentary Nightmares in Red, White, and Blue that he “wanted to do something about Reganism…The crowd was ‘kill a commie for Christ and let’s get those commies and kill them’ something I grew up laughing at in Dr. Strange Love. Now here it was again. It returned and with this massive enthusiasm behind it.” Even as some horror movies served as seemingly progressive political narratives, the genre was also at the peak of slasher films in this decade, a subgenre that has been especially criticized for its violent misogyny, a theme that Wes Craven also participated in with movies like Last House on the Left and A Nightmare on Elm Street. A screenshot of my dataset collected in Excel. After narrowing my focus, I started collecting my dataset, using Wikipedia’s horror movie list (separated by decade) and IMBD respectively. 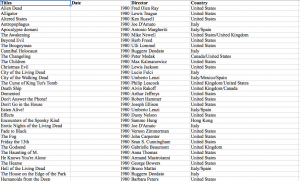 I ended up with 610 movie entries, a small dataset but totally usable in my opinion. 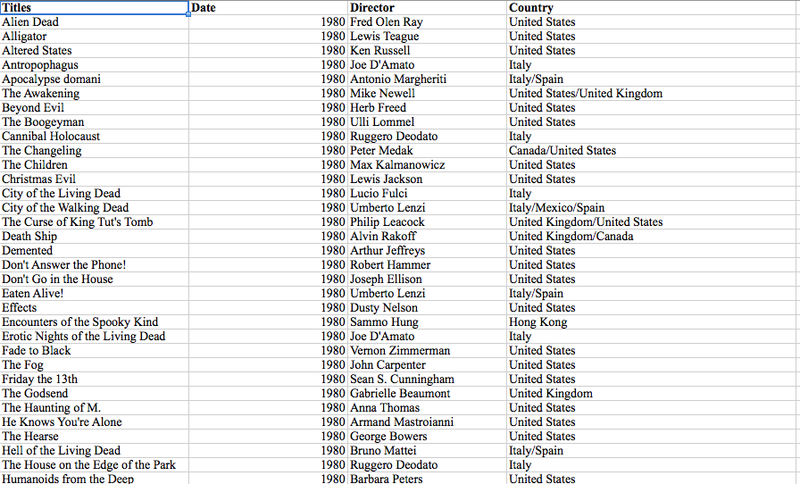 I catalogued the title, date, director, and country of origin for each film, hoping to utilize this information. Now, before I continue with this project I face a couple of predicaments with where I want to take this project. I would really love to catalogue the instances of violent misogyny, as subjective as that may be, and perhaps utilize a digital tool/platform that would showcase repeat offenders by year, director, and country of origin. The problem is, there are over 600 movie entries, not all of which I’ve seen or remember intricate details of, so cataloguing those instances or themes of violent misogyny would be difficult, subjectivity aside. I suppose I could rely on synopses and critic reviews, but I’m not sure if that would provide the best results. The other problem I’m running into is finding a graphing tool that will be able to showcase the dataset for the particular variables I’m interested in (i.e. cataloguing themes of violent misogyny by date, director, and country.) I am leaning towards Gephi since I’ve been playing around with it lately, but I’m definitely open to any other suggestions, as well. This entry was posted in Fall 2014 and tagged dataset project, feminist analysis, Gephi, graphs, horror movies on November 10, 2014 by sydnee wagner.